The Gravel Roadster has given up many of its parts (wheels, bars, brakes and seat) to the Singular Gryphon frameset I’ve been riding for a month or so. I’ll review that bike later, but I want to get some real 29er tires for it. The Gryphon is a mountain bike, and the Gravel Roadster was a road bike. “29er Road Bike” – Can I trademark that? This is a 43cm Fisher Utopia frame (very light aluminum hybrid) with a Kona P2 fork, single ring and 7 or 9 speed cassette. I’m 6’2″. If I were to build this from blank paper (or an actual budget), it would be exactly the same, but in a larger size. This one frame fits a huge range of rider sizes, and if I can get a longer seatpost and another wheelset I’ll probably resurrect it. 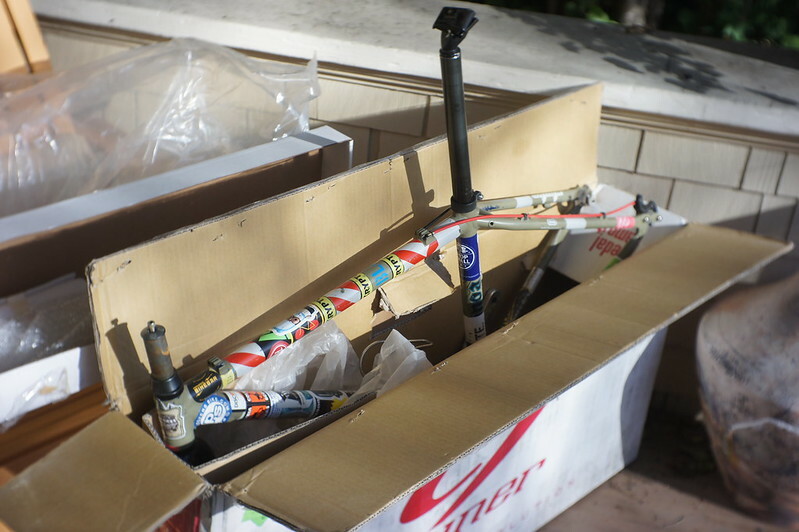 Right now the frame, fork, headset, stem, crankset and seatpost are wrapped up in that Niner box. Any takers? Cheap.